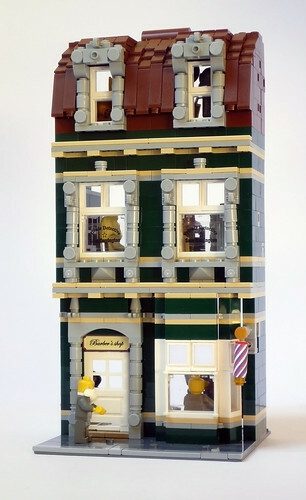 Brick Town Talk: The Maltese Barber - LEGO Town, Architecture, Building Tips, Inspiration Ideas, and more! 1228 Destinity Road - (BTT) Always a fan of odd pairings, this dark green building is certainly as eclectic as it is beautiful. One the ground floor is a barber - perfect for those who have too much hair get some much needed relief. Upstairs is a detective's office, with the P.I. currently talking to a mysterious blonde straight out of a film noir classic. Finally, in the attic, a world-trekking explorer enjoys being surrounded by the spoils of his adventures.